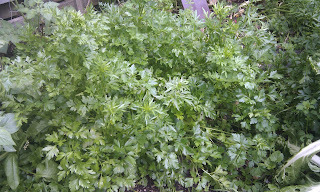 Not only is parsley an easy to grow plant that thrives with little attention, it packs a powerful punch nutritionally. Parsley is the richest herb/vegetable source of potassium. Amongst its many functions, potassium helps balance the acid/alkaline status of the body to a more alkaline state.﻿ Parsley also contains good amounts of calcium and magnesium, making parsley a super source of minerals, and of benefit to helping muscles and nerves relax. Other nutrients it contains are iron and vitamin C. Parsley is powerful! 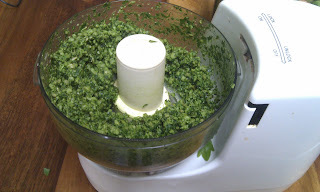 I have resisted making parsley pesto for a long time because I love basil pesto so much. Pesto means basil, basil is traditional, and doesn't deserve tinkering with. However, there has been no basil in the garden since last Summer, but plenty of parsley, so the other day, without much expectation, I tried it. It was wonderful! Other members of the house still prefer basil, but I didn't miss the basil much at all. I'm thinking it may be good to combine the two, since parsley is much more prolific. There are many recipes for pesto around, and you can easily just swap the basil for parsley. I like to give my pestos a bit of a nutritional lift by replacing the pine nuts with either sunflower seeds, raw cashew nuts or brazil nuts. Sunflower seeds seem to work the best. Just place the parsley, seeds (or nuts), parmesan cheese, and half a garlic clove in a food processor and give it a whizz until it's the consistency you like - either fine or chunky. Add a pinch of salt and some olive oil and whizz again. Parsley pesto can be used in many different ways - with wholemeal pasta, a spoonful added to a bowl of soup, spread over grilled chicken or fish, to name a few. Parsley - it's powerful, and in pesto it's delicious! Parsley + lemon water = Awesome! Let me know how the parsley pesto goes.